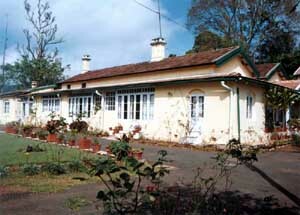 Dunmore House at Coonoor was established during the British rule as the Naval Hydrographic Drawing Office (NHDO). Subsequently, after independence, NHDO shifted to Dehradun and Dunmore House was converted into a Holiday Home for serving and retired Naval Officers. 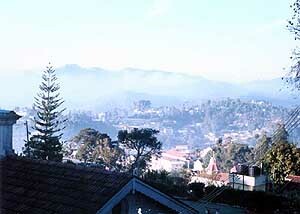 Dunmore House is superbly located at one of the highest points in Upper Coonoor. It is in a very quiet and peaceful place away from the hustle and bustle of the town where the air is clean and fragrant and one can enjoy the chirping of birds. At the same time, it is very well connected due to its proximity (a 5-minute walk) to the famous Sim's Park. Sim's Park, on the Kotagiri Road, is about 6 km from the Coonoor city centre (railway station / bus depot / main shopping centre). There are regular buses from the city centre to Sim's Park throughout the day. Autorikshaws charge about Rs 25 to come to Sim's Park / Dunmore House from the city centre during the daytime and about Rs 40 at night. Dunmore House has 5 suites and 1 independent cottage called 'The Cottage'. Each of the suites and the cottage are double-bedded, with attached bathrooms. The nominal charges for the suites are Rs 50 per night for serving officers and Rs 100 per night for retired officers. The cottage costs marginally more. One can have meals at the dining room -- food is prepared by the civilian staff as per the requirements of the guests on prior intimation and is charged for at actuals. One can also go out to the Sim's Restaurant near Sim's Park (open till 6 PM only) or Quality Restaurant at Bedford (half a km from Sim's Park). There is a beautiful lawn / garden in front of Dunmore House. The view from the garden is quite scenic, as the picture above shows. The lounge has a colour TV with cable connection.